You can easily shape text so it forms a custom shape using Photoshop CC. This is a great way to express yourself. For example, you can write a poem in the shape of a heart. 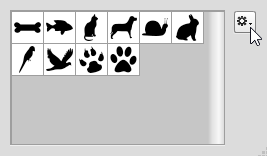 Report facts in the shape of an animal. Or describe your personal interests in the shape of a star. Try it! Click the Custom Shape arrow on the Options bar. Use the tools on the Options Bar to adjust the Fill and Stroke. Draw a shape. Use the Options Bar tools to set the Fill and Stroke. 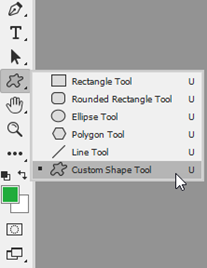 Click the Horizontal Type Tool from the Tools panel. Position the I-beam inside the shape. Wait until the cursor has a dotted circle around it. The mouse pointer changes to an I-beam inside a circle. The smaller the font size the better the words will form to the shape. Select the text. Use the tools on the Options bar to format the font, style, size, and color. When finished,click the Commit checkmark. Use the tools on the Options bar to format the text. The smaller the font size the better the words fit the shape. Select the text layer. Click the Move tool. Drag the words away from the shape. If you need to edit the shape, select the Shape layer. Use the tools on the Options bar to adjust the Fill and Stroke. 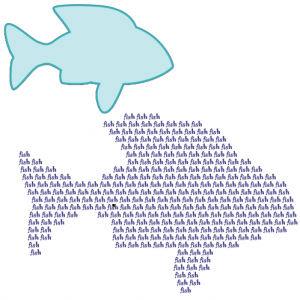 Move and resize the shape or text to create an interesting image. 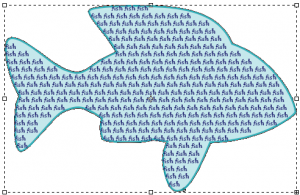 Other fun Photoshop CC activities can be found in TechnoPhotoshop published by TechnoKids Inc. This technology project has lessons that use Photoshop to produce a digital scrapbook.